Although I love the idea of it, and am proud of the fact that the comics industry is unique in giving away books in this way, until last year, I was rather indifferent to free comic book day. Last year, I was working at OK Comics and worked free comic book day (a day most comic retail assistants traditionally loathe) and it was great to see families, kids, and people who don't really read comics so enthusiastic in participation: that for me is what FCBD is about- it's not a reward for buying comics, or a grab-fest. And ideally, that's how it would be everywhere. The downside, for me, is those people who see the attaining of free comics, and in particular certain titles, as having commercial value (to be sold on on Ebay and so forth) and begin queuing/camping out at insane times in the morning in order to get them. Many shops, I believe, have limits on quantities in place, although I'd imagine that's a difficult thing to monitor. Anyway, all 50 titles for this year's free comic book day, taking place on May the 2nd, have now been announced (DC aside, who have a corny 'top secret' stamped on their blacked out covers, but I have no real interest in what they're putting out anyhow, so let us continue) and are up to browse at the FCBD site, so thought I'd pick out what looks good and worth picking up- essentially what I'd pick up if possible. There's not many- just six, and it may be a little early, but hey, you can reference back if needed. Bobs' Burgers: My love for Bob's Burgers the cartoon and the comics is deep and widely circulated. It's a little bit iod and weird, but lovable- the best thing about it is it's depiction of a family who support and celebrate one another's individuality and love each other for who they are. And set in a burger place. 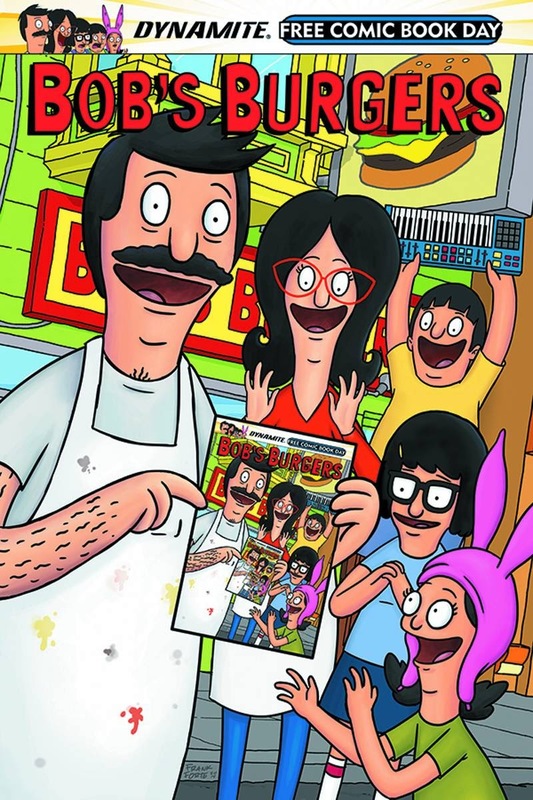 I've bought all the issues of the comic, which is written and drawn by the shows writers and animators, and it's pretty great- if you like the show, you'll definitely like the comic: you get Tina's fan-fiction, Gene's musical pieces, Louise's secret investigations, letters and tips from Linda, and Bob's attempts at burger naming. The FCBD offering is a selection from the comic mini-series, so a nice way to check it out- I'm sure the trade will be hitting soon, and this may swing it for you, if you're curious. Drawn & Quarterly- Supermutant Magic Acadamey: Drawn & Quarterly celebrates its 25th year in 2015 and this is a special, all-ages edition, previewing two of its biggest releases this year: Kate Beaton's follow up to the best-selling and much-loved Hark! A Vagrant, the equally sardonically titled Step Off, Pops! 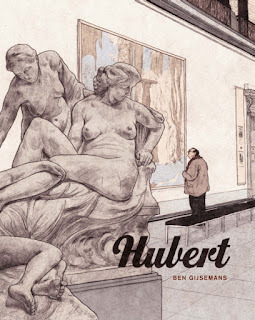 with more irreverent and hilarious comics on history and literature. 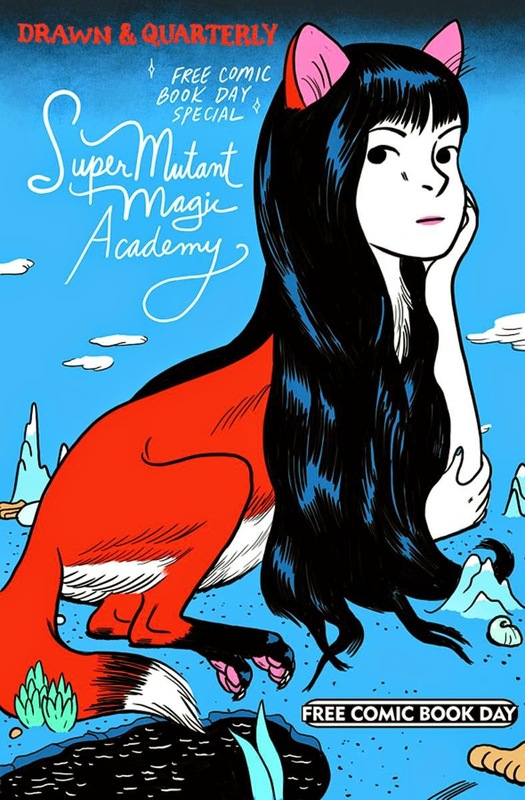 Readers will also get to read pages from SuperMutant Magic Academy, Jillian Tamaki's excellent online comic, which has been running for the past 4 years (the cover to this looks awesome), featuring a teenaged world filled with just as much ennui and uncertainty, but also with a sharp dose of humor. It's going to be difficult for anyone else to match D&Q with this. 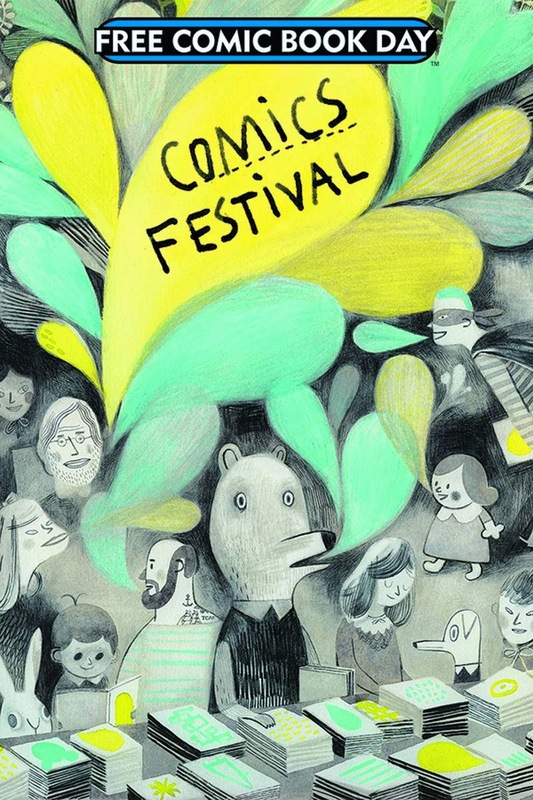 Comics Festival: I don't know much about this, but it looks like this is the 'alternative' offering, which makes it attractive of itself. A compilation of all-new short stories by some of the greatest comics creators in Canada, but I don't really know much more than that. That's another lovely cover, though, and what caught my eye. Something to look into if you're after a bit of difference, a bit of freshness. Kodansha Comics sampler: I'm still unfamiliar with Japanese comics, so use the Kodansha sampler to read excerpts and see if there's anything that piques my interest. 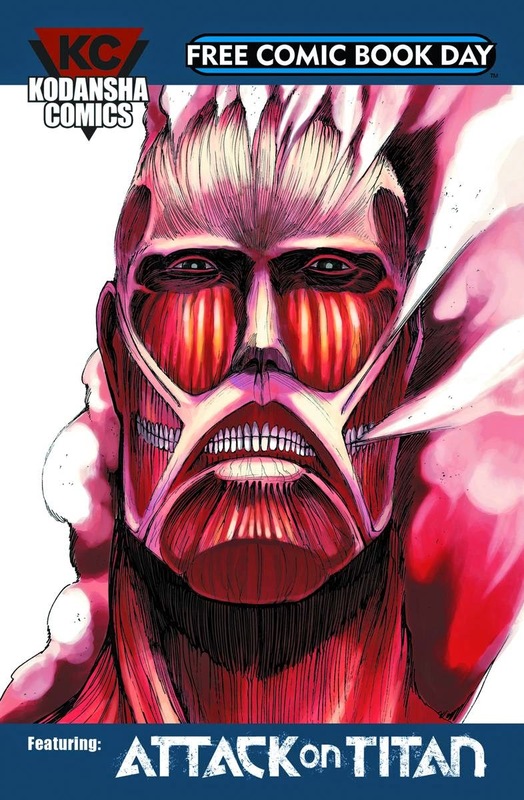 I did read 3 volumes of Attack on Titan, which I still really like the concept of, but all the aerial battles didn't do it for me. It's a juggernaut, though, what with the anime, the live-action film being made and the Avengers cross-over; the realisation of the Titans (particularly the one at the end) in that Subaru ad was pretty cool- curious to see how the film turns out. The Kodansha sampler will include excerpts from Fairy Tail, The Seven Deadly Sins, Noragami, and more. The Stuff of Legend: Call to Arms: Stuff of Legend is one of my favourite books- so creepy, so good- honestly buy the collected editions now, because they're going to be super difficult to find later on. Published by Th3rd World Studios, this is a preview of the fifth and final volume, Call to Arms. 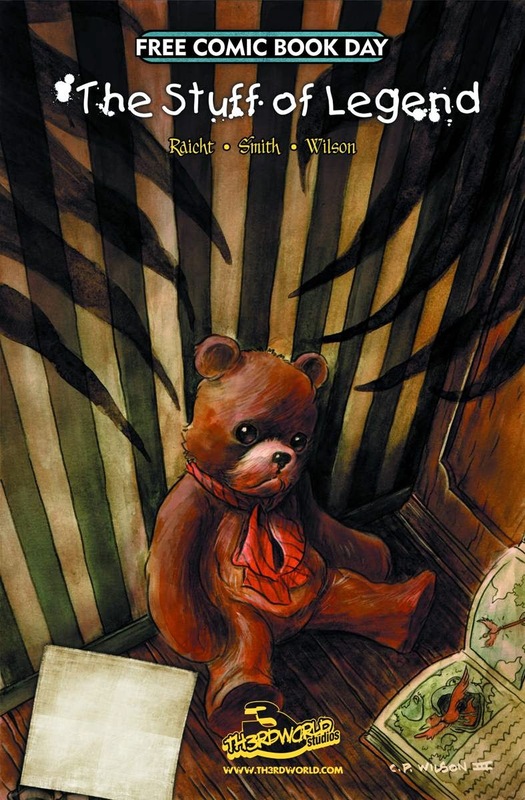 Left scattered across the Dark in the aftermath of the Boogeyman's deceit, the band of Toys must pick up the pieces or risk losing their boy forever. I wouldn't mark Stuff of Legend all-ages because some of it is genuinely scary and perhaps graphic, but suitable for age 7 upwards, I think. This also includes a preview to a new series, Thanatos Diver, about a girl who discovers a sunken city beneath her boring island home, a portal to a world both impossibly exciting and even more dangerous than anything she'd ever imagined. 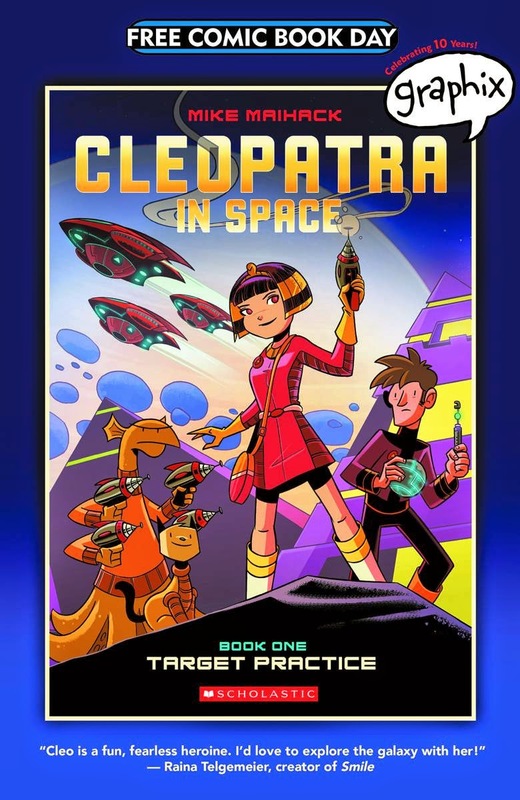 Young Cleopatra: This is the Graphix offering, showcasing Mike Maihack's fun and attractive looking Young Cleopatra comic: 'When a young Cleopatra (yes, that Cleopatra) finds a mysterious tablet that zaps her to the far, really far future, she learns of an ancient prophecy that says she is destined to save the galaxy from the tyrannical rule of the evil Xaius Octavian.' I'm not sure if it will preview any other titles, but even if it's not, it looks to be a nice one for kids. A few others to look out for: the TMNT book, because Turtles, Terrible Lizard, about a girl and her T-Rex, the 2000AD special, and the Boom anniversary special.